Fancy a bit of volunteering? If you love the Animal Health Trust, horse racing and/or cycling and don’t live too far from Newmarket, then we have some volunteering opportunities that might be right for you. Volunteering is a great way to help support a charity, meet new people, experience new things and we need some keen volunteers to help us at the below events. To sign up to volunteer, just email events@aht.org.uk for more information. We’re thrilled to announce that the AHT, in its 75th year, is the first Equine Charity of the Year at Royal Windsor Horse Show next week (10 – 14 May). So if you’re visiting the show, or watching it on TV, look out for the AHT! If you like horse racing you could help represent the AHT on its annual charity race day at the July Course in Newmarket. Every year we are lucky enough to have volunteers run a bucket collection at the end of the day’s entertainment, often raising well over £1,000 in a short amount of time! We’re delighted to be the benefiting charity of the Newmarket Hilly Sportive on Sunday 25 June and need volunteers to help marshal the event and make sure the cyclists make their way round the course safely. If you like cycling, this will be a great event to be involved in as the competitors will find that Suffolk isn’t as flat as you might think! If you’re off to Royal Windsor Horse Show next week (lucky you!) look out for the AHT! We’ll be at the show promoting our work to improve the lives of dogs, cats – and especially horses! – as the Show’s Equine Charity of the Year. Visit our stand in the Shopping Village to find out more about our work, buy merchandise or make a donation. If you’re looking for more regular volunteer work, we are always grateful for the help of volunteers in our Gift Shop and Visitor’s Centre. Southern Counties have released their entries. Eight Glen of Imaal Terriers are entered and the breed in third in ring 2. Terrier day is Saturday June 3rd. Linda Samuel is now compiling the EFG Summer Newsletter and would welcome any contributions, thoughts, ideas, tips, photographs…. There will be a BVA/KC eye testing session (Peter Bedford officiating) at Hedge Green Cottage, Blackjack Road, Swineshead, Boston. PE20 3HH on Saturday July 15th. Appointments are need and can be obtained from Jean Rogers jean@e-f-g.co.uk. This is open to all breeds not just Glen of Imaal Terriers. It would be a good chance to get your Glen eye tested if you are thinking of mating them. Please share this through social media. Do you do puppy packs? BREEDERS! 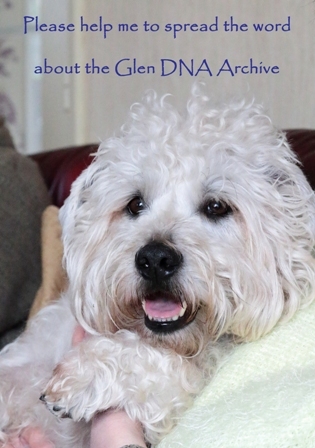 Please help us to spread the word about the Glen DNA Archive!